Although the Constitution already includes a remedy, certain elected officials and public interest organizations are advocating for a constitutional amendment to overturn recent Supreme Court decisions that have corrupted elections, public officials and government. They are using Vermont town meetings as a springboard for the campaign. Critics of the constitutional amendment approach point out that an amendment would not solve the problem, legitimizes the Supreme Court seizure of power over elections, would keep the Supreme Court in charge and diverts from a solution already in the Constitution that more effectively solves the problem with far less effort. The simpler alternative that is already available in the Constitution deserves attention. Supreme Court decisions legalizing private interest financing of election campaigns have enabled a vast increase in private interest control over our federal government. The 1 percent contribute hundreds of millions of dollars in election campaigns to empower themselves and disempower the 99 percent. To keep that money flowing to themselves, elected officials waste enormous sums of taxpayer’s money on government contracts, subsidies, bailouts, wars and tax cuts for the rich. The 1 percent thus receive enormous returns on their political investments. By contrast, the government uses the resulting deficits to justify cuts in needed spending on education, health care, environment, safety and infrastructure that would benefit the 99 percent who do not buy elections and influence. Here is why a constitutional amendment is not needed to end this disenfranchisement of the 99 percent. The revolutionary leaders who wrote the Constitution, fresh from overthrowing the tyranny of King George, included sufficient checks and balances on all three branches of government – including the courts – to prevent the kind of tyranny we now suffer. Under our existing Constitution, Congress already has the power to stop the court from making any more of the decisions that have allowed the 1 percent to buy elections. Then Congress can pass legislation reversing the unconstitutional decisions the court has made to corrupt elections. The Supreme Court shall have appellate Jurisdiction, both as to Law and Fact with such Exceptions and under such Regulations as the Congress shall make (US Constitution, Article III, Section 2). Hence, under the Constitution, Congress has the power to remove Court jurisdiction over financing election campaigns. Removing Court jurisdiction means that the court would not even be able to take up cases involving financing of elections. Congress and state legislatures will then be free to pass laws removing private money from election campaigns. Thus, Congress already has power to curtail the court and the tyranny of private money in elections facilitated by the 5-4 majority of Supreme Court judges whose goal is to empower the 1 percent at the expense of the rest of us. Separately, Congress also establishes and controls all “inferior courts” (Article III, Section 1). It is not just the Constitution. As early as 1803, in a case called Marbury v. Madison, the case in which the Supreme Court established judicial review, the court also recognized that it must not decide questions that are “in their nature political.” Regulating elections and their funding to prevent corruption is a quintessential political question. For 173 years, the courts followed this mandate and declined jurisdiction over such political questions. Under Article I, Congress also has the exclusive power to judge the elections of its members. All this changed in 1976 when the court injected itself into election financing and overturned long-established law, deciding that corrupting money in politics is constitutionally protected speech. The court, not Congress, established as law that putting money in the pocket of a politician has the same protected status as speech by a citizen. Thus, the court allowed the 1 percent with money to drown out the speech of ordinary voters. In that decision and in 5-4 decisions since then, the Supreme Court also violated its own long-established precedent of keeping out of political questions so it could unleash special interest money in politics. By doing so, the court overstepped its judicial powers and intruded on Congress’ legislative powers to regulate and judge elections. the court thus violated the separation of powers which is the most fundamental bulwark the Constitution provides raised against tyranny. The disenfranchisement of the 99 percent and auction of public policy to the 1 percent is the consequence of Congress’ failure to maintain the separation of powers with respect to election integrity. 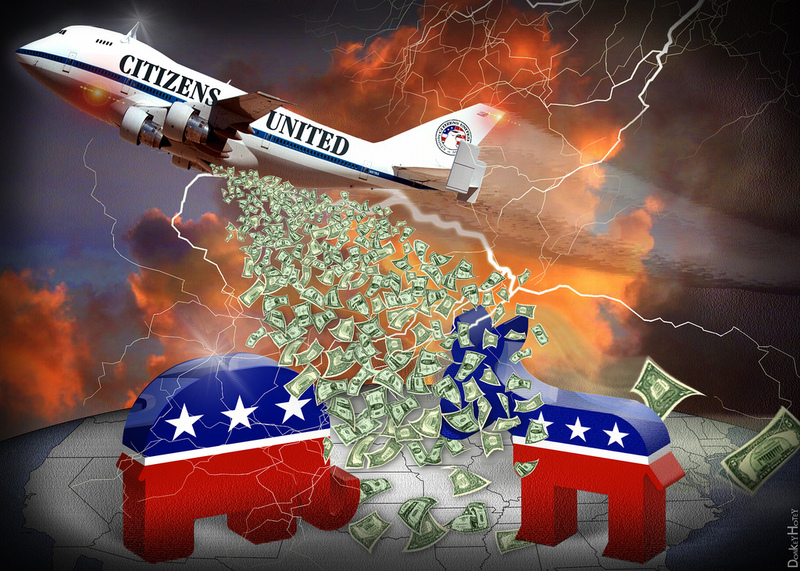 The decisions since 1976, including the 2010 Citizens United decision, addressed an increasing problem for the 1 percent. Faced with an aroused public, Congress had earlier passed vast amounts of progressive legislation, including the Clean Air Act, product safety and food safety laws, the EPA, the Clean Water act, the Occupational Safety and Health Act, consumer protection laws and laws regulating campaign contributions and spending. One of the ways the 1 percent fought back to empower themselves and disempower the 99 percent was for pro-corporate presidents to nominate pro-corporate justices, who would make elections a commodity that corporations and wealthy individuals could finance and control. By enabling the upper 1 percent to buy elections, the court put an end to rule of, by and for the people at the federal level and within most states. The court not only put a stop to progressive legislation, but they turned the government into an instrument to increase the wealth and power of the 1 percent. To its credit, Vermont has successfully resisted the power of money in several recent elections. But recent Supreme Court decisions allow an overwhelming flood of private interest money, even putting democracy in Vermont at risk. Now is the time for we, the people; our towns; and our states to demand that Congress use its existing power to re-establish the bar on court jurisdiction over financing election campaigns, establishing public funding and removing private interest money from elections. Tragically, the recently initiated drive for a constitutional amendment dangerously leads the public away from demanding that Congress act now using its existing power. It implements delay. It substitutes an incredibly difficult approach. It legitimizes the court’s illegitimate seizure of jurisdiction over a fundamental political question. It also demeans the American revolutionaries, who purposely and intentionally wrote this important check and balance into our Constitution for just such a circumstance as the one we face now. And asserting that the only solution is a constitutional amendment diverts, weakens, confuses and demobilizes people. Even if a heroic public managed to mobilize in great enough numbers to force passage of a constitutional amendment, the amendment would not actually solve the problem if jurisdiction over election financing is left in the hands of this court. The majority on the Supreme Court, having already violated their constitutional mandate, would find other ways to use that continuing jurisdiction to make bogus decisions that maintain and expand the power of the 1 percent. What is needed is for Congress to remove jurisdiction over financing election campaigns from the jurisdiction of the court. So the court is entirely out of the picture on this subject as the Constitution and Supreme Court precedent required. The revolutionaries who wrote the Constitution provided Congress with the constitutional power to do just that. Misleading the public away from that heritage and that power will only legitimize and entrench the status quo. A constitutional amendment requires a two-thirds vote in each House plus ratification by three-quarters of the states within seven years, an incredibly high bar. A law requires only an ordinary majority in each House to deny court jurisdiction over funding elections and to pass legislation removing private interest money from election campaigns. Certainly, achieving an ordinary majority will be a difficult task. A mass movement, such as initiated by Occupy Wall Street but far larger, is needed to demand power for the 99 percent, equality and an end to rule by the 1 percent. As difficult as demanding and achieving ordinary legislation is with a Congress already corrupted by money in elections, achieving a constitutional amendment will be inestimably harder. The possibility of building the required movement is enhanced if the public understands that Congress already has the power to accomplish the goal with an ordinary majority vote. And that no almost insurmountable hurdle, like two-thirds of each House and three-quarters of the states within seven years, blocks the way. Occupy Wall Street initiated the necessary mass campaign and it can continue to press for immediate action to overturn the gross inequality in political and economic power. By continuing to use the right to assemble, speak, petition and occupy, introduce resolutions at town meetings and unions, picket, march, rally, strike, sit-in and hold elected officials accountable handed down by our revolutionary forebears who inspired the Constitution, they can continue to build that mass campaign to force Congress to take action now. They can demand that Congress use the brilliant check and balance on court jurisdiction those revolutionaries included in Article III Section 2 of the Constitution. Occupy Wall Street need not be diverted, nor its goal delayed, with a useless quest for a constitutional amendment. James Marc Leas is a patent attorney in Vermont. USDA Cuts: Gentlemen, Start Your Salmonella?